Augustus J. Veenendal Jr., retired as Senior Research Historian at the Institue of Netherlands in The Hague. 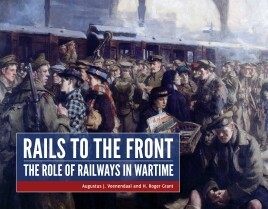 He is the author of a large number of books and articles on Dutch, American, and international railroad history, including his latest Het Grote Spoor Boek (Zwolle: W-Books). H. Roger Grant, Kathryn and Calhoun Lemon Professor of History at Clemson University in Clemson, South Carolina, is the author of 31 books, including his latest, Railroaders without Borders: A History of the Railroad Development Corporation (Indiana University Press). "Elegantly produced, beautifully illustrated and written in a style which is both authoritative and accessible this book comes highly recommended. " "This work is illustrated with a remarkable collection of photographs, augmented by posters, works of art, drawings, maps, and diagrams drawn from many sources, official archives and private collections."